Over the past few years, gaming has grown leaps and bounds. Most new games have similar budgets to Hollywood movies, and put in mammoth efforts not only towards the visuals, but also the sound. Gaming consoles in particular, are meant to be connected to Hi-Fi surround sound systems and deliver a cinematic experience. Sound engineers put in months of hard work so that even the smallest ‘thump’ of your character’s boots, or the engine sound from the car you’re driving ingame sounds perfect, so it would be folly to not experience any of it, right? If you’re not the kind to game in full surround sound, the next best thing is a great pair of headphones to really immerse yourself in the game. 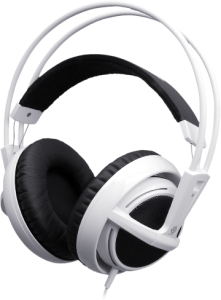 Contrary to popular belief, gaming headphones are quite similar to music oriented ones, only it’s that they include a microphone for communication, and are often made to look funkier. If it’s only sound quality you want, even a pair of music oriented ones will be perfect. However, for gamers who play multiplayer games, a microphone is absolutely necessary. So if you’re looking to get yourself a new pair of gaming headphones and are confused about what to get, you’ve come to the right place! We’ve got 10 awesome gaming headphones listed that you can buy, at pretty much every price point, so there’s something for everyone. Remember when we said that normal music oriented headphones will do just fine even for gaming? Yep, they will. Kicking off our list is the Audio Technica ATH-AX1iS, an affordable pair of headphones with a built in mic, albeit not the attached to ear sort. On a budget, this offers excellent sound quality, and looks pretty cool too! They’re available in multiple colors as well, and are quite lightweight. You can’t really talk about the best gaming headphones without mentioning the SteelSeries Siberia range. This legendary piece of hardware has been loved by gamers worldwide for years, and despite its age, still remains a fantastic choice even now. Available for a very affordable price, it’s the perfect way to get into the world of gaming headphones, and you won’t be disappointed with the investment at all. It’s comfortable and offers good stereo sound quality, and perhaps the only fault it has is that the mic is not the retractable sort, just like the first entry on this list. Cooler Master is one of those companies that has a great range of products under the CMStorm brand, but is criminally overlooked in favor of more popular companies like Razer and SteelSeries. They tend to offer products with similar features at a more affordable price, and that’s exactly why we’ve chosen the Ceres-500. It’s a good looking, comfortable and feature rich pair of headphones that has a surprisingly great range of sound output. You can also remove the microphone, turn the headphones inwards and fold them to carry around, so traveling LAN gamers will find it a good buy. The only downside is that it requires a USB connection to operate, to power the built in amplifier. Think of gaming accessories, and Razer is probably the first company that comes to your mind. Along with a superb range of gaming mice and keyboards, Razer also has a pretty killer line of gaming headphones. 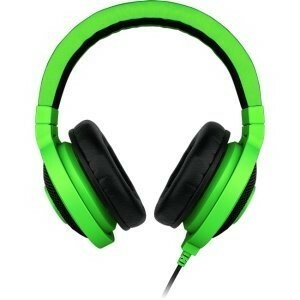 One of our picks is the venerable Razer Kraken Analog, a bright green pair of headphones that looks and sounds awesome. But there’s also the catch, while the bass response and range is pretty sweet, it doesn’t come with a microphone. That’s reserved for the higher priced Kraken Pro. However, if you’re more of an offline gamer, you won’t find any faults in the Kraken Analog. 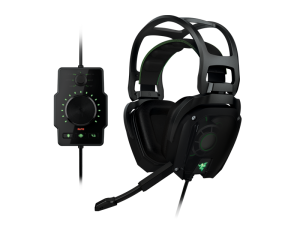 Alternatively, if you really do need a mic at this price range and must have a Razer, you can pick up the Razer Elektra, which sells for slightly less than the Kraken Analog at Rs. 3900. One of the first things you’d notice upon laying your eyes on the Logitech G430 is the design. 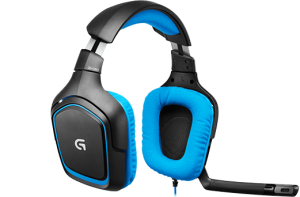 Quite honestly one of the most catchy looking gaming headphones available, the Logitech lives up to its legacy by offering killer sound quality. It’s the most affordable pair of gaming headphones that offers full 7.1 surround sound, so if you’re into atmospheric games, this is a must buy. The surround sound is actually impressive, bass response is excellent and the highs and lows are good as well. The only cons are that it’s available only in one color, blue, and it’s compatible only with PC. 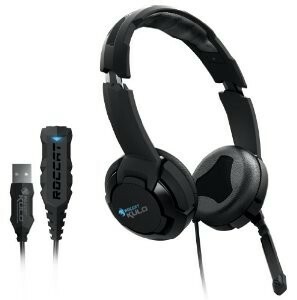 Roccat Kulo is another fantastic pair of gaming headphones that offers full 7.1 surround sound support. It might be getting a little long in the tooth, but we can’t fault the performance even now. The good looking pair of headphones also come with a USB compatible virtual 7.1 sound card for best performance. You can also use the regular 3.5mm jacks, but you’d probably prefer the USB connection anyway. One pretty handy feature is the automatic mic mute, which turns off the mic if you fold it upwards. The surround sound also works pretty well, and is a boon while play FPS games, especially online. A great buy for the price! Owned by Mad Catz, the Tritton series of headphones is another range we think that isn’t given its due. 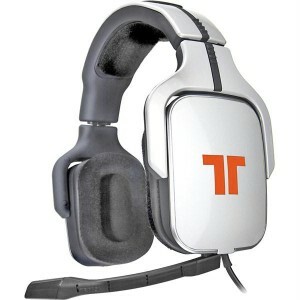 Specifically, the Tritton AX Pro is one of the few headphones that features true 5.1 Dolby Digital Surround. Yessir, none of that virtual stuff, this here is the real deal. The big headphones aren’t just for show, because they house 4 separate speakers for individually channeled sound. Also included is a control device which allows you to adjust sound and change between Dolby Pro Logic and and Dolby 5.1 Surround Sound. As you can imagine, the sound is phenomenal, and unlike most headphones. Honestly, it’s more than awesome value for money. The fact that this is the second Siberia series pair of headphones on the list speaks volumes about how good SteelSeries are at making gaming headphones. The newest member of the family offers the excellent sound quality for gaming made better, and is one of those no-nonsense headphones. No claims of super-extra-mega-whoopdeedoo bass and all that, but a crisp and clear sound perfect for gaming. It does come with custom software that allows you to tweak the sound, but that’s about it. 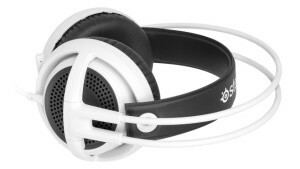 In terms of build quality, the Siberia V3 still stands out, but a definite con is that the headband is non-adjustable. When you think of gaming headphones, Sennheiser is probably not a company that comes to mind, but boy have they knocked it out of the park with the U320. 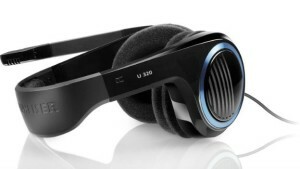 As always the U320 features excellent build quality and doesn’t have any gimmicks, it’s purely great sound. 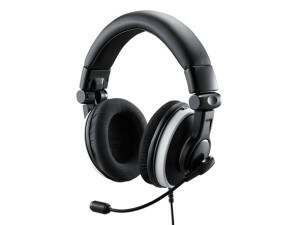 It’s comfortable, compatible with all consoles and PCs, and features separate volume control for game and chat audio. The main USP is the universal compatibility, so if you’re a gamer who uses multiple platforms and wants the best aural experience from all, the Sennheiser U320 should be in your arsenal. The Razer Tiamat 7.1 is the big daddy of gaming headphones, featuring 7.1 surround sound (as you can imagine), supreme sound quality, excellent noise cancellation and comfort. The steep price is definitely something to consider, but if you’ve got the setup for it, the Tiamat 7.1’s sound quality is nigh unbeatable. Note that for the 7.1 surround sound experience, you’ll need a compatible soundcard, without which it will simply run in stereo mode, which is honestly a waste. There’s some pretty cool features like the microphone that can be hidden in the left ear cup, an in-line volume and sound control that lets you tweak individual channels and changeable ear cup backplates, as well as logos that light up. The ultimate gaming headphones available in India! So those were our picks for the best gaming headphones you can buy in India! 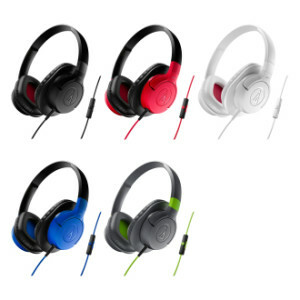 Note that there are more options and better ones, but unfortunately, they’re not sold in India. We’re talking about the Turtle Beach range, the Astro range and even the high end Creative range, so if you get the chance to have all these options, you’re choices might change. Do let us know what you thought of our list via the comments below!